"The graduation bookmarks arrived and I am beyond pleased! They are fabulous! Thank you SO much! The bookmarks will be such fabulous favors for graduation party guests. My second son is graduating next year and my third son will be graduating the next year, so you'll be hearing from me at least two more times! 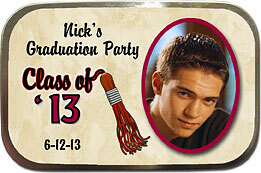 - Brenda R.
"We had a big graduation party, so I ordered both the photo mint tins and spiral photo notebooks as favors. You did such a great job and everybody loved them!" "Our photo graduation bookmarks arrived today and we are so very pleased with them. My daughter is thrilled to be able to have such nice favors for her graduation party." 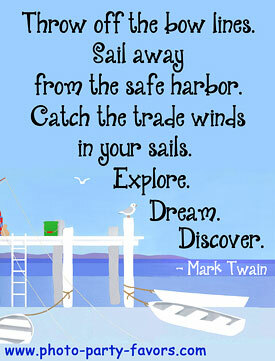 - Deanna R.
Party ideas & tips, Printables, - Recipes, Holidays, - Quotes, MORE! Whether you're planning a party to celebrate a high school graduation, college graduation, or even a pre-school graduation our photo graduation bookmarks will be the hit of the party! These photo bookmarker favors are especially appropriate for a graduation. We combine your photo and message with our original designs to create personalized graduation party favors you won't find anywhere else. Some photo birthday celebration bookmarks can be substituted and adapted for graduation favors. Actual photo graduation bookmark size is 2 ½ x 6 ½ inches (not including ribbon). Borders, graphics and message can be interchanged on photo graduation bookmark favors. You can even interchange with designs in other categories. Messages on above graduation bookmarkers are only suggestions. You may change the wording to create your own, personalized message. Look at the sample text used in the bookmark of your choice as a guideline to how much text can be used for personalization. We always email you a proof of your graduation photo bookmarkers order within a couple of days of receipt, so that you may check it for accuracy, and we only send your order to production after we have received your approval. Sample of a past photo graduation favors order can be obtained if you send an SASE with $2, which will be refunded (minus postage) with your next order. You may specify which design sample you wish to receive. We also have photo graduation invitations and announcements available, which include your multiple photos. Don't forget to check out our photo mint tins, as well as our photo graduation magnet favors. These are unique photo party favors that would be great for any graduation celebration. EMAIL your high resolution jpg photo (or photos, if the design requires more than one) for graduation photo bookmarks to PhotoPartyFavors@aol.com. Please include your name, shipping address, phone number (in case we have any questions), what you're ordering, how many, the last possible date you need it by, the personalization desired, and confirmation that you have mailed (or will be mailing within the next 24-48 hours) your check made payable to Linda Kling. 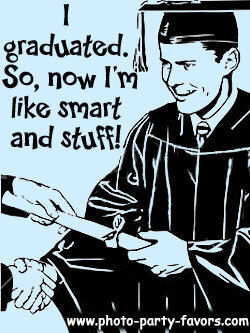 We also have Graduation Invitations available. Any questions or comments about our photo graduation bookmarks or our photo party favors? Send us an e-mail at PhotoPartyFavors@aol.com. You can also check our FAQ page for answers to common questions. Don't forget to check out our Graduation Quotes page for great sayings for your graduation invitations, favors, announcements, website, etc!